It’s that time of year again, pull out the cowboy boots, plaid and jean shorts and take it to Country Thunder! While some of us are better at roughin’ it than others, there are quick and easy ways to take that city look to the country. Bandanas, braids and cowboy hats will be your best friend over these next 4 days. You don’t want to miss out on the fun by spending a bunch of time on your hair. At Nicole Marie Salon, we planned a hair survival guide to your long weekend in the sticks! For this festival, it is all about simplicity. No one wants to lug a huge bag of hair products and tools to a campsite. We have just the right amount of things for you to bring without even having to worry about washing your hair! We say these are your go-to items: sea salt spray, a couple of bobby pins, dry shampoo and accessories! Bring a cowboy hat and a bandana and you will be set. On your first day, when you are still feeling fresh and you get there ready to go, throw a few braids or twists in the front of your hair to keep it out of your face. It will still look cute and give it that little country touch without trying too hard. A half up look is effortless but the braids or twists give it a girly, fun touch for your first night of concerts. Day 2: Wake up and your pretty much ready! Take out those braids and twists, embrace those natural crimps and throw some sea salt spray in your hair. Voila! You are ready to have yourself a day. The sea salt spray brings out your natural wave and adds texture to your unwashed hair. Day 3: Throw in some dry shampoo! It will help you feel refreshed and somewhat clean. You could also use the sea salt spray to tousle those fading waves. This is the day your cowboy hat will be your bestie. Toss it on and no one will ever be able to know your hair is 3 days old. You will look like a cowgirl ready to meet her cowboy and be ready in a jiffy! Day 4: You made it…you have almost survived and so has your hair! Reward yourself by throwing those waves up in a bun. Getting the hot hair of your neck will give you the boost you need to get through your last day. But never fear, there is still a cute finishing touch to complete your country look…your bandana! 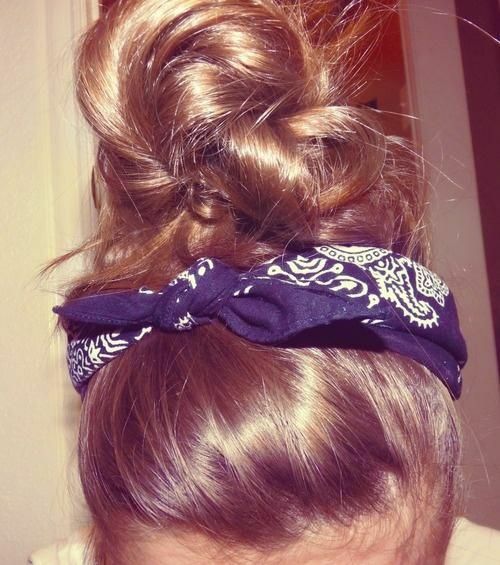 Wrap it around your bun, tie it up as a headband, make it messy. There is no wrong way to do it, so have fun with it and have fun closing out Country Thunder with a bang! Whatever you choose to do with your hair, we hope this guide helps and we hope you have a blast! Peace. Love. HAIR.